Jennifer of Bake or Break just announced the October 2007 DMBLGIT awards and I managed to nab a host award on my very first entry! A big thank you to Jennifer and all of the judges, and congratulations to the winners this month. You can have a looksee at the creative and mouth-watering October 2007 entries here. but does my blog look fat in this?! Next week is Yankee Thanksgiving as our Canadian chums had their Thanksgiving last month. I know the menu for most people will consist of turkey and the usual suspects. I like turkey, but (and don’t laugh) I don’t think I want turkey on Thanksgiving. Strange, I know. When my sister was a kid, she insisted on turkey. It all ties back to the Thanksgiving of her fourth year (I wasn’t born yet) when my parents went to a lot of trouble to make Peking Duck at home – a real treat. The next school day, the teacher asked who had turkey for dinner and every kid raised their hand… except for Kris. She was the laughing stock of her kindergarten class and she stormed home to inform my parents that they had perpetrated this humiliation upon her. Ever since then, we were sentenced to turkey for Thanksgiving. The day I left for college was the day my father threw off the shackles of turkey. I called from school to wish my parents a happy Thanksgiving and asked what they were having. dad: we are having fish! dad: no, i vetoed it. i hate turkey. i made a very nice spicy tofu fish. now that you kids are gone, you have no vote! Well, I wasn’t the one insisting on turkey, but I had to laugh. I always preferred Virginia Smithfield ham (the salty kind that makes your salivary glands go into overdrive just thinking about it) to turkey anyway. Jeremy and I are completely irreverent individuals when it comes to holidays. In the past we have spent Thanksgiving dinner on the flanks of a snowy western summit, gnawing at cold turkey jerky and drinking hot cocoa in the vestibule of our tent hoping that the approaching storm wouldn’t wipe us off the mountain before daybreak. Giving thanks can take on a whole new meaning. Thanksgiving has now become the holiday of making something that tastes great and doesn’t take all day because we’d rather get some skiing in (tele, xcountry – I’ll take it any which way). Last year was king crab legs and this year…?? Well, this year it looks as if our snow delivery is over a month delinquent. I haven’t decided yet, but as the day draws near I find I’m lacking inspiration. I suppose if I had succumbed to turkey it would be a no brainer, but I never make my life that straightforward. Anyone else out there who bucks tradition? Forget tradition, I’m making Prime Rib! Couple hours in the oven and dinner is on. That sounds good. Something about beef or seafood is quick. Congrats Jen! I thought your photo was really beautiful, I’m not surprised it was a winner!! My mom makes a seafood hot pot with mussels, clams, squid, catfish/salmon, shrimp and sometimes snails. She adds a Thai twist by using a little Nam Prik Pao in the broth. She adds a vegetable platter with Napa cabbage, scallions and maybe chrysanthemum leaves. It’s a lot of fun and delicious too! Good seafood is hard to come by here where I live so I probably won’t carry on the tradition unless we move. Congrats on the photo award. 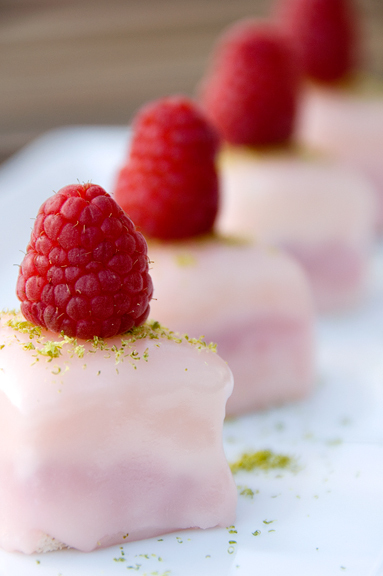 Great angle on the petit-fours. And one more thing, I got a kick out of telling my friend that you initially thought he was my father. Whoops, sorry John. Anita – that’s so sweet of you. I thought your photo was lovely and deservedly honored. HB – Mmmm, hot pot is so good. I’ve never had it with chrysanthemum leaves though – do you purchase them at a grocery or do you just grab them off of the flowers? (wondering before I go and eat something that might kill me!) Thanks on the DMBLGIT. Sorry about mistaking your friend for your dad. I laughed out loud when I realized who he was! I usually find chrysanthemum leaves in the veggie section of the asian grocery store – not sure, but I don’t think they’re actually leaves of the chrysanthemum plant. I forgot to mention the Kaffir Lime Leaves, Lemongrass and Galangal are also added to the Nam Prik Pao. Basically, it’s a heartier version of Tom Yum Soup that everyone partakes in cooking. Mandy – thanks so much. You have a point there about turkeys and t-giving. I dunno! HB – Oh, good to know about the leaves since I would probably go and harvest something poisonous – ha! Wow, that dish sounds so amazing. Do you and Pierre celebrate t-giving in tradition or do you also buck tradition? Congrats Jen! The petits fours caught my eye too. Being without Thanksgiving until I married an American, I never really gave some thought until I was served beaten old day dryer than dry turkey at his sister….and since it is not “my” holiday I have to wait until Chritmas to take my revenge!!! Then again, with both parents born in Morocco and both sets of grandparents stationed there during the war, a traditional Moroccan mutton/chicken/spicy sausage couscous was most likely to be served than turkey and chestnuts…! I guess one day I will cook a turkey but for right now I like to stick to capons, geese and ducks…and so far no comlaints from the husband! Mmm, that sounds fantastic to me :) Perhaps I am drawn to something other than what is dictated as tradition?